The St. Anthony's Rare Book Collection, numbering c. 280 items, formed part of the library of St. Anthony's Franciscan College which was acquired by UCG in 1992. The collection contains many rare and interesting works on topics ranging in scope from theology and apologetics to bardism and Norse mythology. The centrepiece of the collection is part of a 1497 commentary on the Gospels by the printer of the Nuremberg Chronicle, Anton Koberger. Our copy is embellished with hand-painted initials and is bound in C16th blind-tooled alum-tawed pigskin. The tome is in remarkable shape for an item of its age. If you would like to view/ consult either item, please submit an online request or contact the staff of the Special Collections Reading Room in the Hardiman Research Building at specialcollections@nuigalway.ie. You do not need to make an appointment. Drop in, if you would like to know how to improve your writing. You can bring your past assignments, drafts, or other recent work to start your one-on-one session. Find out what resources (databases, journals, etc.) are available and how to use these resources effectively to write better essays and assignments. Sessions will take place in the Nursing & Midwifery PC Suite. You will learn how to manage references using EndNote X6 for Windows and how to use its 'cite while you write' feature. It is important that you are already familiar with searching databases (e.g. Business Source Complete) before doing this workshop. The venue is the Library Training Room on the Ground Floor of the James Hardiman Library. You may wish to view the following tutorials in advance of the workshop. Tá neart cóipeanna den treoir seo ar fáil sa Leabharlann chomh maith. Start the new term with a visit to the fabulous new Special Collections Reading Room in the Hardiman Research Building and view Dictionary of Greek and Roman biography and mythology (London, 1849). This beautifully bound three volume set was awarded to Richard Blair Bagley by Queen’s College Cork in the 1850s for a First in French. R.B. 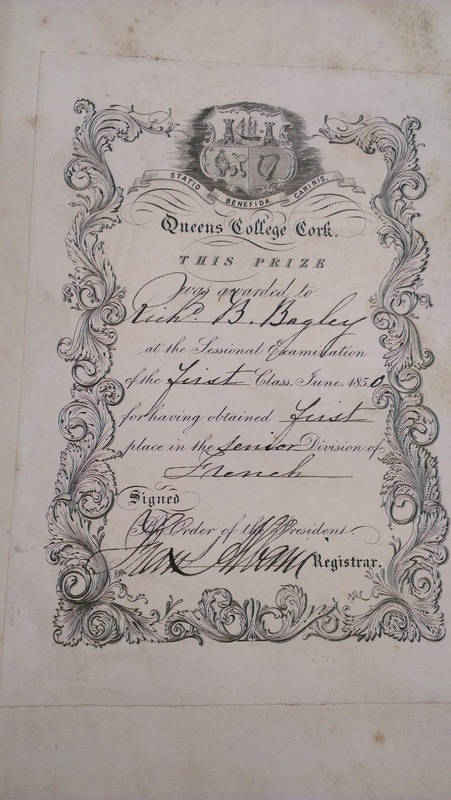 Bagley (d. 1869) became Professor of Latin at Queen’s College Galway in 1854. If you would like to view/ consult this item, please submit an online request or contact the staff of the Special Collections Reading Room in the Hardiman Research Building at specialcollections@nuigalway.ie. Free Help with Essays and a Chance to Win an I-Pad: the AWC is Now Open. The Competition is Live. The Academic Writing Centre is now open. We offer help with academic writing at all levels. The AWC is on floor 2 of the James Hardiman Library. You do not need to pre-book an appointment, just drop in, and we'll help you. The AWC is now running a writing competition for undergraduate students. Back in Semester 1, many first year students attended 'Getting Started in the Library' sessions. At these sessions they learned how to find their way around the library, find the books they need for their study and where to get help if they get stuck. During the sessions students were asked to complete a survey and everyone who did was entered into a prize draw. We're delighted to announce the winners of that draw. 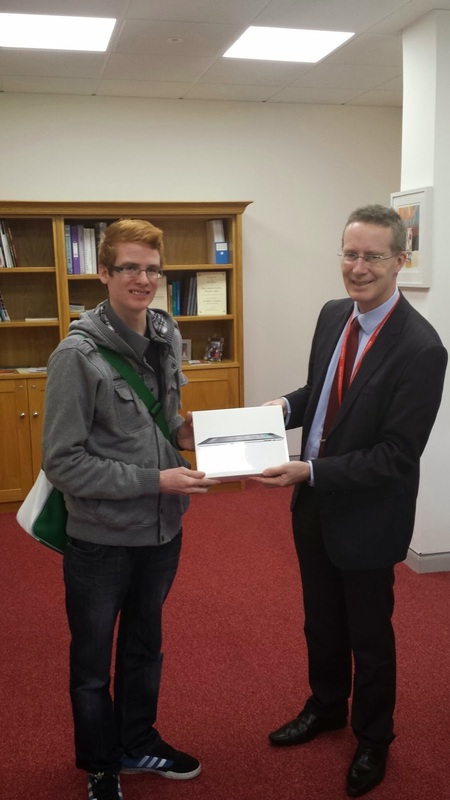 Congratulations to Alan Joyce, 1st Arts, seen here receiving the first prize of an iPad from University Librarian, John Cox! Second prize winner was Kevin McDonnell, 1st Physics, seen here receiving a One-For-All Voucher from Monica Crump, Head of Information Access and Learning Services. We've been in touch with the winner of our 3rd prize, but they haven't come back to us yet. It could be you! Please check your NUI Galway email address to see if you've been notified of winning a prize! If you missed our 'Getting Started in the Library' sessions, it's not too late. These sessions are being held at 11.00, 2.00 and 7.00, Monday to Thursday until January 23rd. They are also run at 7.00 on Friday evening and 11.30 on Saturday morning. No need to book just drop in to the Library Training Room!